Welcome to the first edition of Give Good Gifts! Our goal here at All Gifts Considered is to help you in “living life generously.” To that end, we’re launching a periodical link roundup on all the best gift ideas and creative giving opportunities to inspire your generosity. Give Good Gifts will be a place to find fun and interesting products, unusual and quirky gift ideas, super-premium-expensive gifts and almost-free DIYs. We’ll highlight gift traditions and etiquette from around the world, ways to give back to your community, and thoughts on how to steer away from the self-centered materialism promoted by our culture and towards a life of simplicity and Christ-like sacrificial giving. The title and aim of this series is drawn from Jesus himself, the best Gift Giver of all. In Matthew 7, Jesus was teaching his disciples to ask God for what they need knowing that he is ready to give. If you want to live life more generously, ask God, and he will give you the heart and means to do so. I’m praying that God will use this blog to inspire that sort of thing. So let’s learn how to give good gifts, and learn too how much more our Father in heaven is prepared to give us even better gifts! And don’t worry, future posts probably won’t have a lengthy intro like this. Any commentary will be reserved for AFTER the resources. Some of the links below include affiliate links, which means we might get a commission should you choose to purchase something on our recommendation. We do our utmost to recommend only the very best! Gift GETTING Etiquette – How to Receive a Gift the Right Way – We’ll start with one of our classic guides on how to get a gift. As recipients of grace, it’s important to learn how to receive. Gift Idea: Oregon Trail Handheld Game – For those who grew up in the ’80s, you remember the Oregon Trail computer game. Recently my family got me the Oregon Trail Card Game, which is awesome because it teaches our kids how to handle failure (we’ve never beaten it; typically someone dies of dysentery in the first round and it only goes downhill from there). Well, now they have a handheld version that pretty well emulates the original. You know you want it. Why Amazon Smile Doesn’t Make Me Smile – Perhaps you’ve heard of Amazon Smile, which allows you to give a portion of your purchase on Amazon to the charity of your choice. Sounds great, right? Well, maybe not. 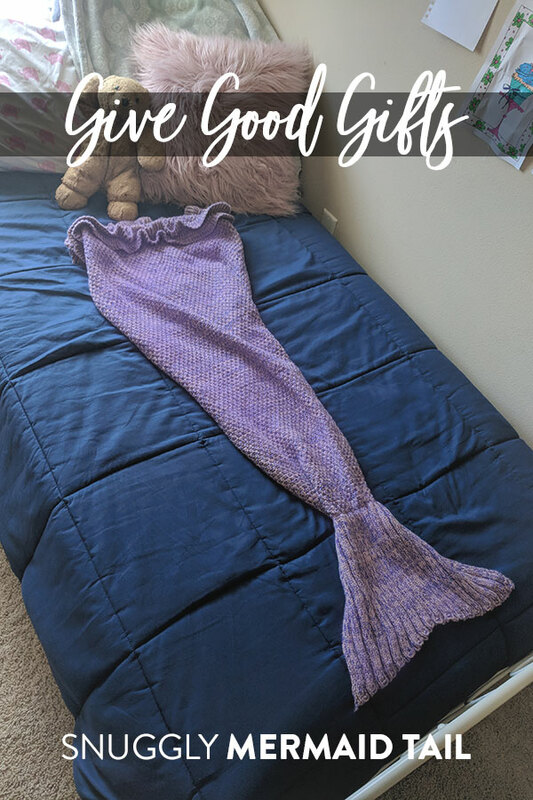 Gift Idea: Mermaid Tail Snuggle Blanket – My sister gave this to my daughter for her 10th birthday. In our house, we love blankets, but this one has been taken to the next level. 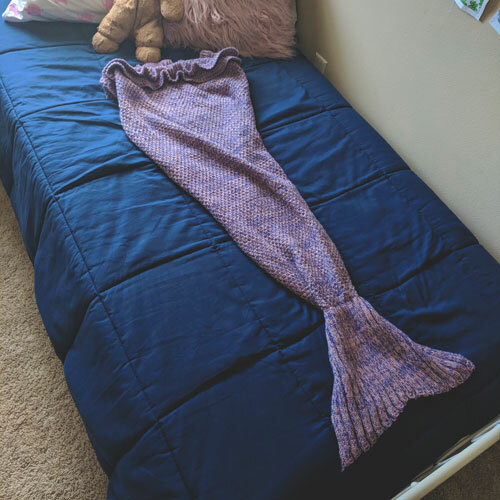 For the past several months she has gone to sleeep – every night – on top of her comforter but tucked into her purple mermaid tail. That’s the Amazon version, which is very decently priced. Level up with a hand-crocheted version on Etsy, or, for the little gents, a Shark Snuggle Sack. That’s it for this edition! Bookmark, follow, RSS, or sign up for emails to see new posts and catch each volume of Give Good Gifts. 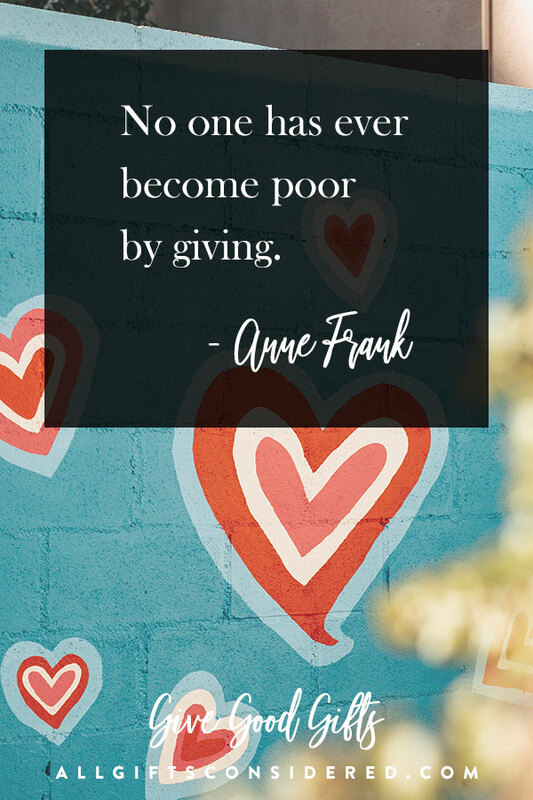 Let’s learn to live life generously!